Columbus announced last week that it won't be closing for business, saying it prefers to emphasize Veterans Day instead. 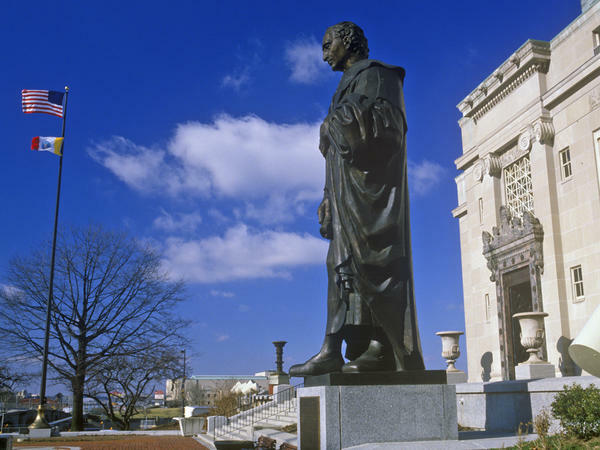 Here, a statue of Christopher Columbus is seen in a file photo, standing outside the Columbus City Hall. The release concluded, "In honor of those who have served in the military, the City of Columbus will be closed on Veteran's Day on Monday, Nov. 12, 2018." Columbus had not previously observed Veterans Day as a city holiday, says Robin Davis, the director of media relations for Mayor Andrew Ginther. "Columbus is home to 110,000 veterans," Davis said in an email to NPR. "We are excited to be able to honor those who have served our country by observing Veterans Day this year." When asked how the city made the change, and whether it had done so through a process that was open to public debate, Davis said the decision to stay open on Columbus Day "was agreed upon by all of the unions that represent city workers during regular contract negotiations over the last year." The Ohio city stopped short of the moves made by Phoenix, Denver and others that now observe Indigenous Peoples' Day on the second Monday in October. When Cincinnati followed suit last week, member station WVXU reports, it did so "to celebrate the thriving culture and value that all indigenous people add" to the city, and to recognize "the annexation of indigenous homelands." The idea of changing the traditional holiday has often sparked intense disagreements. As Julie Carr Smyth of The Associated Press reports, Columbus hopes to make "a savvy move to tie the switch to a politically safe demographic: veterans." But one of the most-liked comment on the posting came from Jesse Bobo, who wrote, "I cannot understand people being upset over this.... I would much rather see Veterans honored." Amid the controversy, another person wrote that if the name Columbus is so polarizing, the city shouldn't stop at the holiday: It should change its name altogether. Columbus Day has been a federal holiday since the 1930s, but as of 2015, less than half of U.S. states had moved to give their employees a paid day off on the day. Several states, including Alaska, Hawaii and Oregon have never recognized it. Critics of Columbus complain that the holiday mythologizes a man blamed for bringing slavery and death to the "New World." His backers celebrate his place in history, and his Italian heritage. Amid the debate, many also note that on Oct. 12, 1492, the explorer made landfall in the Bahamas, not in what later became the United States. A search through the social media accounts and web pages of Columbus Mayor Andrew Ginther and several city council members found no mention of the change on Monday. The choice to de-emphasize its namesake comes as Columbus prepares to open the new National Veterans Memorial and Museum on Oct. 27, ahead of Veterans Day next month. Despite the change, the city's youngest residents might not notice. Public schools in Columbus are open on both Columbus Day and Veterans Day, according to the school district's calendar.